The impact of the microbiome on human health continues to dominate biomedical research dialogue. Taconic Biosciences is leading the animal model industry in providing the widest portfolio of products and services to enable researchers to study how the microbiome impacts their projects. TruBIOME™, a first of its kind solution, enables the generation and maintenance of gnotobiotic mice with defined custom microbiome profiles. TruBIOME™ enhances Taconic's suite of microbiome products and services, to provide the most comprehensive solution in the industry. Beyond generating and maintaining mice with a defined custom microbiome, Taconic is also the only commercial vendor to provide germ-free mice, germ-free derivation, custom microbiota association, microbiome profiling, and a proprietary microbiome repository. 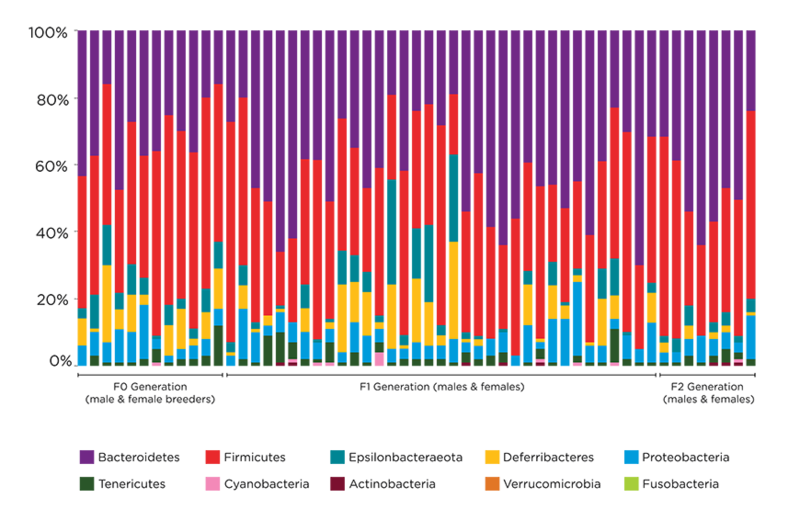 The microbiome is increasingly cited as a key factor in multiple diseases, neurological conditions, and immune responses to foreign pathogens. Specific compositions of gut commensal bacteria have been associated with an increased incidence of depression, varying responses to immunotherapies, and the progression of Parkinson's disease through the gut-brain axis communication pathway. In addition, the presence or absence of specific microbes can impact the performance of a model and key readouts, with perhaps the most well-known example being that of the impact of gut microbiota containing segmented filamentous bacteria on the development of specific immune responses. Leveraging Taconic's decades of experience in breeding germ-free models and providing gnotobiotic husbandry solutions, TruBIOME™ is the solution for researchers who need to understand the variables impacting their projects and affecting the development of next-generation microbiota-based therapeutics. TruBIOME™ models are custom-generated based on the specific microbiota needs of each customer's research project. These axenic mice can be obtained from Taconic's commercial colonies or produced from a germ-free derivation service. This initial Founder (F0) generation is then used to produce subsequent generations which can fulfill study cohorts of animals based on customer needs. Additional evidence of Taconic's derivation, microbiology, and husbandry expertise is shown in Figure 2. Breeders, F1 animals, and the final F2 generation cohort successfully maintained microbial diversity throughout the breeding process, demonstrating that commensal bacterial richness and consistency can be maintained from founder to experimental cohort. Additionally, all TruBIOME™ colonies are quality controlled, and quarterly reports are released on microbial composition. of gut microbial bacteria in male and female breeders, in F1 offspring at day 56, and in F2 offspring at day 56. The Wild Mouse gut microbiota was licensed from the National Institutes of Health's (NIH) National Institute of Diabetes and Digestive Kidney Diseases (NIDDK) by Taconic in 2018. While some research focus has revolved around eradicating microbial species from the intestines, the wild mouse microbiome provides insight into how the host responds to various diseases and treatments naturally. Researchers are then able to compare the results obtained from their studies with this microbiome to germ-free and specific defined flora mice to study the collective effects of different commensal bacteria. This microbiota profile does not contain any pathogenic species. However, it does contain Helicobacter spp. and common non-pathogenic protozoa commonly found in the Wild Mouse gut microbiome. The complete list of species can be found here. The Altered Schaedler Flora is a model community of eight anaerobic bacteria that are essential for proper gastrointestinal and immune functions. This microbial profile consists of: ASF 356: Clostridium sp., ASF 360: Lactobacillus intestinalis, ASF 361: Lactobacillus murinus, ASF 457: Mucispirillum schaedleri, ASF 492: Eubacterium plexicaudatum, ASF 500: Pseudoflavonifactor sp., ASF 502: Clostridium sp., and ASF 519: Parabacteriodes goldsteinii. The colonization of murine intestines with this community of microbiota enables the study of drug interactions, pathogen effects, and immune responses to cancer, inflammatory bowel disease, and autoimmune diseases. When compared to germ-free mice, mice with ASF microbiomes are better suited for combating pathogenic infections and maintaining normal GI health. Interested in your own TruBIOME™ colony? Please inquire with Customer Service.